i'm currently living in a pretty basic loungey uniform consisting of splendid leggings (i have them in the XS; the foldover detail is pretty genius), seamless camisole, everlane cardigan, giant Acne scarf, and short black Uggs. we just got a bunch of water and storm supplies ready for the snowpocalypse. i'm hoping the power doesn't cut out, and will be looking forward to watching the snowfall from our windows, lighting a Diptyque candle or two, and catching up on some movies. as this blizzard makes its way along the East Coast, i hope you all stay safe and warm and get to enjoy a day or two of cozy hibernation at home! are you home today for this massive storm? 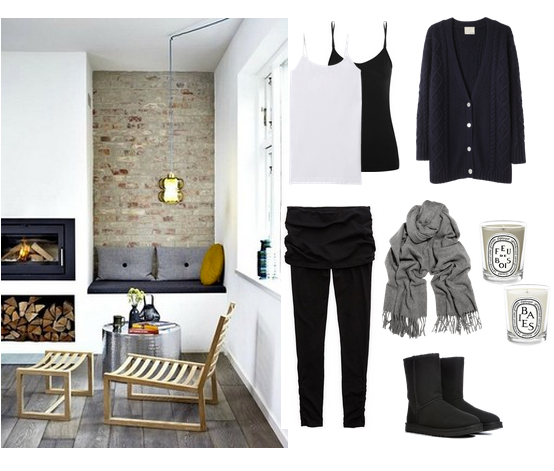 what is your favorite cozy winter pastime? Great cozy outfit! My snowed-in wardrobe has been Splendid black thermal sweatpants, white VINCE tank top, GAP gray boyfriend pullover sweater, and cozy socks my daughter gave me for Christmas. That, plus movies, hot chai tea, and snacks!